KL Dartboard turns your iPad and iPhone combo into a dartboard and darts over bluetooth. 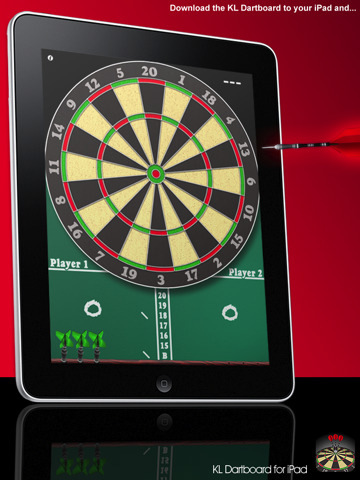 The iPhon apps (darts) are free, you just buy the dart board (iPad app). Connecting the two together is pretty simple, using the guided Bluetooth steps and the app even turns on your Bluetooth for you if you’ve disabled it. Throwing darts requires an iPhone as mentioned and only takes a simple shake action to launch a dart. The iPad senses your tilt (left/right/up/down) and the board will magically get hit with a dart in a split second. You even get a nice little dart sound. Although the idea behind the game is nice, getting the hang of how to hold the iPhone to get the darts to land where you want the to, takes a long time to figure out. The app does link you to a help page for instructions, but there is no on-screen aim guide or indicator which would be helpful in teaching new comers how to hold and throw to get the right results. Basically it seems you need to hold the iPhone the same as you do when you’re talking, not flat. And it helps to get some distance as in the real world. You can grab the free KL Darts app or for some added graphics try the $0.99 KL Darts Pro app, with 8 designs you can choose from like Skull, Flames, Butterflies and Aliens. The app automatically keeps score for 2 players. You can also setup a second iPhone so you don’t have to pass the same iPhone back and forth. The colorful cork board looks appealing too. Some new features that would be nice would be to have swappable themes for the dartboard and a single player mode. Overall, KL Dartboard is a novel idea for bringing this awesome game to your iPad. Holes in your wall and beers are not included. Now you just have to find out how to mount your iPad on the wall. AppSafari review of KL Dartboard was written by Joe Seifi on July 7th, 2010 and categorized under App Store, Fun, Games, iPad apps, Multiplayer. Page viewed 6117 times, 1 so far today. Need help on using these apps? Please read the Help Page.